Saltwick Bay is a northeast-facing bay situated 1 mile south of Whitby. Above the bay is Whitby Holiday Park with the Cleveland Way cliff top path running through it. Access to the beach is via a footpath just beyond the park's gate. The path has suffered from some erosion; in places can be quite steep and also very slippery when wet. The path leads down to the sandy beach which gives way to rock and slate scar at either end. To the left is Saltwick Nab and to the right is Black Nab. If fishing from either end, be aware of the tide, as it travels quickly across the scar. The beach and rocks reveal much of Saltwick's alum mining past, and it is also a great venue for finding fossils such as ammonites and belemnites. Why not visit Saltwick Bay beach. There is lots of wildlife to be seen and also you will find fossils from years ago. Whitby Jet can also be found where local jewellers make beautiful jewellery from it. This can be an expensive stone but very popular. 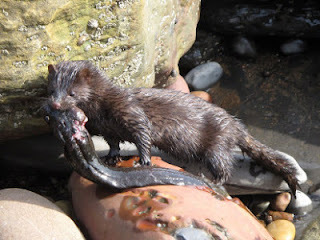 This mink was spotted on the beach here having his meal.